The old NOEL sign had its days… in wind, rain, heat, being blown over several times during rooftop storage and it was ready to be replaced, with a fancy new LED NOEL sign being considered, when a very wise suggestion was made by Town Administrator Duncan Wilson and Mayor Farhad Ghatan. They said that old NOEL sign is such a part of Friday Harbor history and a Welcome Sign to all that if it could be saved or rebuilt, that would be preferred and recommended. Their suggestion inspired the San Juan Lions Club to make the old sign new again and keep the memory going as it has been for over 25 years. 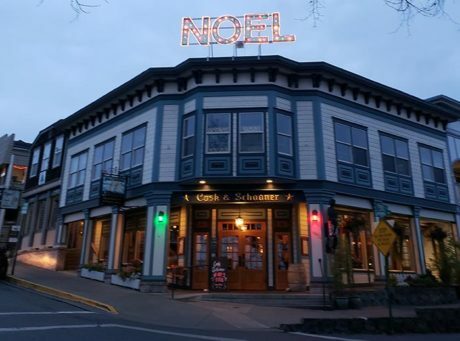 So, we rebuilt the “Historic NOEL Sign” to place on top of Cask & Schooner / Tops’L Restaurants (Town Square Building). Lions Brian Brown and Jim Carroll dismantled the 25+ year old sign in early October and took it, piece by piece, to Brian’s garage, where he ordered up new aluminum for an entirely new frame which should be good for another 25 years or more. The only salvaged part of the original sign was the back plastic lettering that holds all new lights in place. 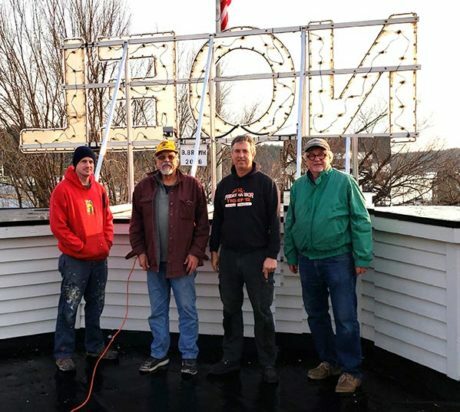 Brian Brown donated colored Christmas lights and new electric lines to rebuild the sign while Jim Carroll donated the entire set of rope lights to outline the lettering. Dan Brown (Brown’s Heating & Refrigeration and Brian’s son), local contractor Chris Bateson (Mercury Construction), Brian Brown and Jim Carroll, all carried the new 6 foot tall by 14 foot wide sign back up to the top of the building on the morning of November 13, 2018. Dan and Chris were the Lion’s “Go To Guys” to climb up and bolt the sign together on that cold, somewhat icy roof top. The NOEL sign, years ago, was atop the Ferry Landing building, until someone complained and wrote a letter to Olympia in either 1998 or 1999, as it was considered a religious sign on top of a public building and WSF told Lions to have it removed. So the San Juan Lions placed it across the street at Friday’s Crab House for that year. Then the following year, and thereafter, the NOEL sign was moved over to the top of the Town Square Building, a privately owned building, and placed high up, for all to see, not only from the ground, but when the ferry makes its final turn into Friday Harbor. That is “THE INITIAL” Season’s Greeting to Friday Harbor. Now you know some history of something that may have been taken for granted for over a quarter Century. The San Juan Lions Club has made it a nice memory for years prior and for many more years to come. “Where there is a Need, there is a Lion” for over 101 Years and now for 57 Years on San Juan Island, Since 1961. Thanks to the Lions for originally doing the sign and keeping it going. I remember when it was on the ferry building and someone complained. Separation of Church and State or some such nonsense. Thanks to the Lions who put in so much appreciated time and effort to keep Noel lit.